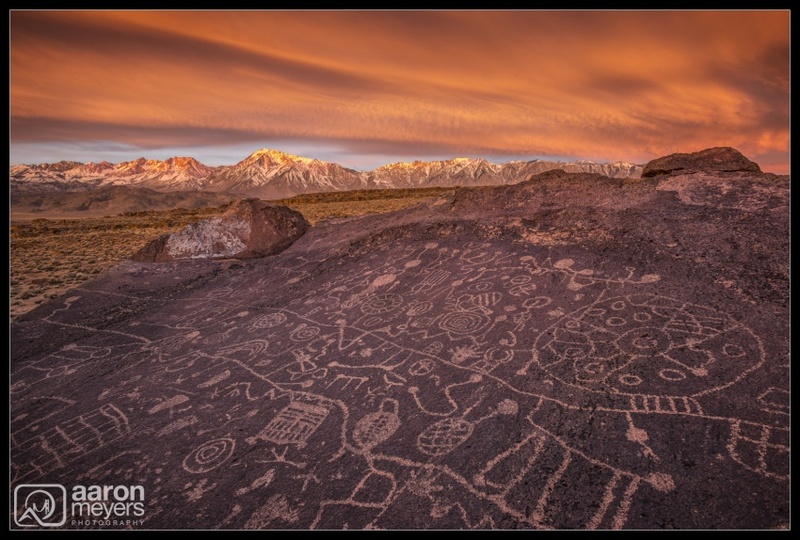 It’s not every day that you can witness snow capped peaks and 5,000 year old petroglyphs while the sky explodes with color around you. As fate would have it I was treated to this amazingly rare scene while on a weekend trip to the Eastern Sierras. Knowing how special this morning was I made sure to cherish every moment of it, as well as to step away from the camera to embrace the scene and take it all in. Carved thousands of years ago by removing the top layer of granite these symbols let ones imagination run wild as to their meaning. The weekend was spent with early mornings, long car rides, constant Wunderground iPhone App checking, a little bit of prayer, much less complaining than the previous weekend, and most importantly beautiful scenes. In all I drove about 1,000 miles, saw my first Joshua Tree, roamed around dry lake beds in Death Valley, bundled up in jackets, stripped down to just shorts and t-shirts, survived a snow storm, and explored natural sandcastles. The weather reports for this weekend had been changing daily and it wasn’t until the hotel cancellation deadline had passed that the trip became a reality. Boy am I glad it did! The previous afternoon started with clear skies and no cameras but as the sun started to set I caught my first glimpse of the clouds. After sprinting back to the car, lots of exhaustion and a race with time my 4th attempt at photographing the petroglyphs ended with a colorless sunset. It was early to bed and even earlier to wake but my 5th attempt turned out much more successful! The storm clouds had finally rolled in and as I began my trek to the petroglyphs I watched as the sky lit up with beautiful pinks, oranges, and reds all around me. I constantly walked in circles just to take it all in. What an amazing morning!